When John Wesley Powell led an expedition down the Colorado River and through the Grand Canyon in 1869, he was confronted with a daunting landscape. 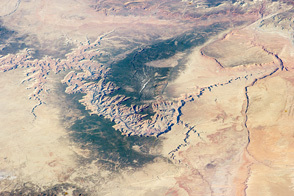 At its highest point, the serpentine gorge plunged 1,829 meters (6,000 feet) from rim to river bottom, making it one of the deepest canyons in the United States. In just 6 million years, water had carved through rock layers that collectively represented more than 2 billion years of geological history, nearly half of the time Earth has existed. Powell was, of course, seeing the canyon mainly from river level; there was no technology that provided views of the landscape from space then. 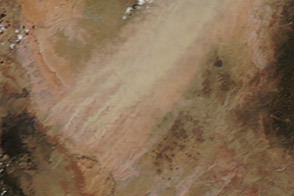 If there had been, he would have seen something similar to what the Operational Land Imager (OLI) on the Landsat Data Continuity Mission (LDCM) did on March 29, 2013. 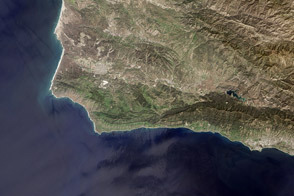 LDCM is an Earth-observing satellite that launched from Vandenberg Air Force Base in February 2013. In the image above (top), the Colorado River traces a line across the arid Colorado Plateau. Treeless areas are beige and orange; green areas are forested. The river water is brown and muddy, a common occurrence in spring when melting snows cause water levels to swell and pick up extra sediment. 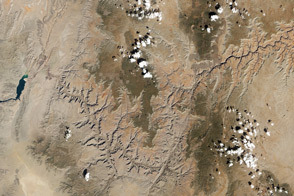 The black line that follows the river in the upper right side of the image is comprised of shadows. One of the geological features that attracted Powell’s attention was a set of rapids at mile 183 of the canyon. Powell called the rapids Lava Falls (middle image), a reference to old lava flows that spilled from the Uinkaret Volcanic Field just north of the river. When lava flowed into the river, it left dams that were hundreds of meters high in some cases. These dams blocked the river and created huge reservoirs until the Colorado found ways around them. “Just imagine a river of molten rock running down into a river of melted snow. What a seething and boiling of the waters; what clouds of steam rolled into the heavens,” Powell wrote of Lava Falls. Because of its name, many assume that the rapids at Lava Falls are caused by debris from lava flows that entered the river from the north. In fact, material from periodic landslides from Prospect Canyon to the south are the main source of debris, according to research conducted by U.S. Geological Survey scientists. It took Powell months to navigate the gorge. By the time he had arrived in the area that is now Lake Mead, his men were weary and four had deserted. For water and sediment transported by the Colorado, the journey is much quicker; it takes just a handful of days. 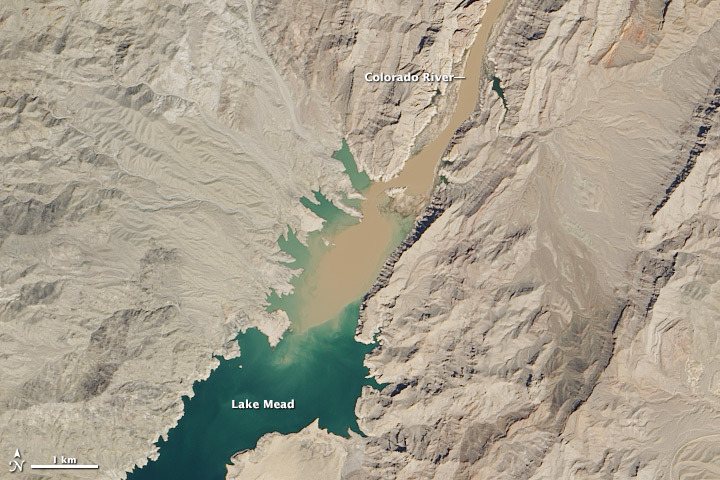 The flow of sediment into Lake Mead (bottom image) from the Colorado deposits a thick layer of material on the bottom of the reservoir. At the mouth of the Colorado, the area that has seen the most accumulation, sonar studies have shown that sediment thickness exceeds 80 meters (262 feet). 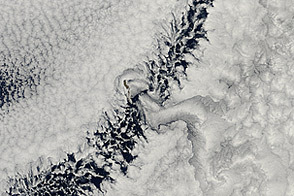 Note that this image is considered engineering data—data that is helping scientists and engineers ensure that the satellite and its instruments are operating as designed. Once LDCM completes its check-out period and becomes fully operational for science, NASA will pass control of the satellite to the U.S. Geological Survey and LDCM will be re-named Landsat 8. Read more about LDCM’s birthplaces—the locations in the United States where Landsat missions have been conceived, built, and controlled—by clicking here. NASA Earth Observatory (2012, July 23) Landsat Looks and Sees. PBS (2012, July 23) Lost in the Grand Canyon. Accessed April 19, 2013. 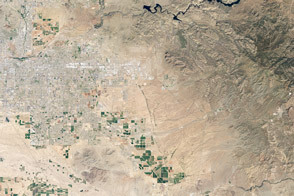 Satellite image by Robert Simmon, using Landsat data from the U.S. Geological Survey and NASA. Caption by Adam Voiland. The geology of the Grand Canyon has amazed visitors since John Wesley Powell first navigated the Colorado River in 1869. Now the Landsat Data Continuity Mission (LDCM) offers a new view of the gorge. The LDCM satellite began returning test imagery in March 2013. Here are some of the early returns. Arizona State University Nature, Culture, and History at the Grand Canyon. Accessed April 19, 2013. Grand Canyon Explorer Grand Canyon Explorer: The Powell Expedition. Accessed April 19, 2013. 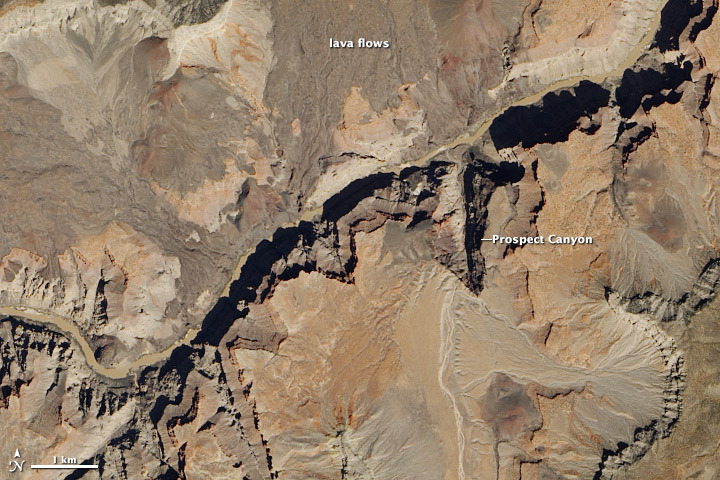 Grand Canyon River Guides A Fresh Look at Western Grand Canyon Lava Dams: Introduction. Accessed April 19, 2013. 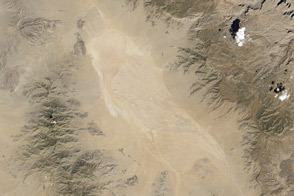 NASA Landsat Data Continuity Mission. Accessed April 19, 2013. NASA The Landsat Program. Accessed April 19, 2013. Oregon State Uinkaret Volcanic Field, Western Grand Canyon, Arizona. Accessed April 19, 2013. 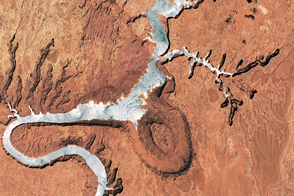 Webb, R. et al (1999) Lava Falls Rapid in Grand Canyon; effects of late Holocene debris flows on the Colorado River. USGS Numbered Series, 1591, 90. USGS The Colorado River: How Fast Does it Flow? (pdf) Accessed April 19, 2013.